American Canvas Products, Inc. traces its roots over 100 years in San Francisco, through four generations of current owner Tim McGill’s family. 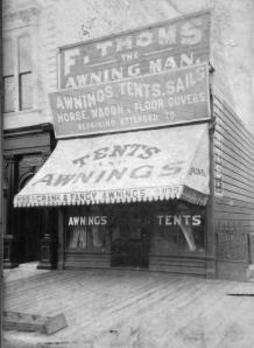 After working for F. Thoms Awning Company on Mission Street since 1900, Tim’s great-grandfather FH (Fred) Behnke bought out Thoms in 1911 and founded American Tent and Awning Company, which was incorporated in 1916. The company name was changed to American Canvas Products, Inc. in 1966. 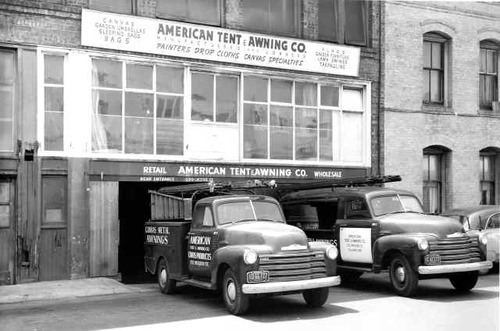 The awning company eventually passed on to Behnke’s son, grandsons, and great-grandson. In the 1960s “The Shop”, as it is affectionately called, was moved to its current location near Bayshore Blvd. Early photos of San Francisco show the extensive use of awnings for businesses. Retractable awnings of the time used cast iron crank arms and hand-build gear boxes, some still in use in the city. Tim McGill is always happy to discover old gear boxes from his grandfather’s time and has even refurbished some of them for continued use.